Comment: Pair of chrysoprase, the most valuable neon blueish green variety of chalcedony, one of the oldest gem varieties with millennia of history in astrology, healing and literature. 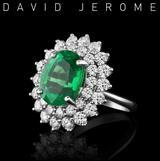 The intense color rivals emerald or paraiba, radiating from a silky smooth translucent body reminding of jade or nephrite. Sometimes called 'prase', they are hard enough for jewelry, though a protected setting is advisable. These two obviously offer themselves as earrings but could also be used as sidestones for a posh design in ring or pendant. For the latter, do note that even this relative small size produces 6x4mm gems, far bigger than a 40 point sapphire or diamond. As mentioned elsewhere, chrysoprase is a perfectly respectable alternative to jade, cabochon emerald or softly colored paraiba in cabochon quality. 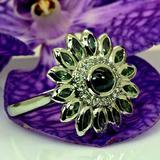 As durable as emerald, though slightly softer than jade or paraiba, they deserve a careful setting. Once in earrings, they will not be in danger unless you dine with Hannibal Lector. The skin-colored background swallows much of the glow in the hand-shots, but only on camera, in person they are always intense blue-green, as visible as an oasis in the dessert. Let us set them in white gold, dangling from diamond studs (we carry all setting risk). Double IGI report, so you can be sure not to let treated glass or polymer filled quartz besmudge your estate.